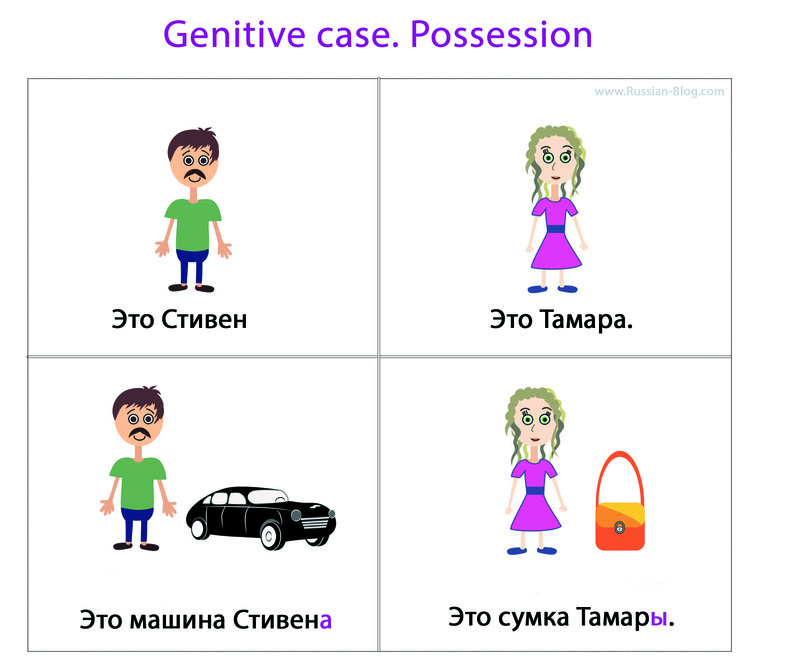 The genitive case is used to show the possession. The word which means the owner changes its ending. And it is important to mention that the word for possessor goes after the object. For example, “дом Марка” (it is like “House of Mark”). Look at the picture and guess, what endings are for masculine and feminine nouns. I hope that you could find that for men the ending is -a (actually for all masculine nouns, also inanimate) and for feminine nouns the ending is -ы.
Это Джон. Это дом Джона. – This is John. This is John’s house. Это Елена. Это сумка Елены. – This is Elena. This is Elena’s bag. Some masculine nouns have the ending -я instead of -а in Genitive. It happens when a noun ends in the soft mark (-ь) or -й. And in this case we are replacing the last letter (not adding after). Это Игорь. Это дом Игоря. – This is Igor. This is Igor’s house. Это Сергей. Это друг Сергея. – This is Sergey. This is Sergey’s friend. And some feminine nouns have the ending -и instead of -ы in Genitive. If a feminine noun ends in -a, we should replace it with -ы, but if a noun ends in -я or soft mark (-ь), we replace it with the -и.
Это Мария. Это компьютер Марии. – This is Maria. This is Maria’s computer. Это дверь. Это ручка двери. – This is a door. This is a handle of the door. And don’t forget that the letter -ы is never written after one of 7 letters: к, г, ж, щ, ш, ч, х . So that means, if there is one of those letters before the ending -а, we have to replace it with the -и (not -ы) in the genitive case. Это девушка. Это машина девушки. – This is a girl. This is girl’s car. Это собака. Это кровать собаки. – This is a dog. This is dog’s bed. It is important to remember that, if a masculine noun ends in -а or -я (like feminine nouns), they have endings like feminine nouns (-ы or -и). Это мужчина. Это паспорт мужчины. – This is a man. This is man’s passport. Это Джанлука. Это офис Джанлуки. – This is Gianluca. This is Gianluca’s office. Это папа. Это фотографии папы. – This is my dad. These are dad’s photos. But if a female name ends in a consonant or -и. (which never happens with Russian female names), the ending doesn’t change. Это Кейт. Это паспорт Кейт. – This is Kate. This is Kate’s passport. Это Тэмми. Это визитка Тэмми. – This is Tammy. This is Tammy’s business card. And many Italian or Spanish male names end in -o (Diego, Alfredo, Stefano). These names are also stay the same in Genitive. Это Диего. Это жена Диего. – This is Diego. This is Diego’s wife. Это Джорджо. 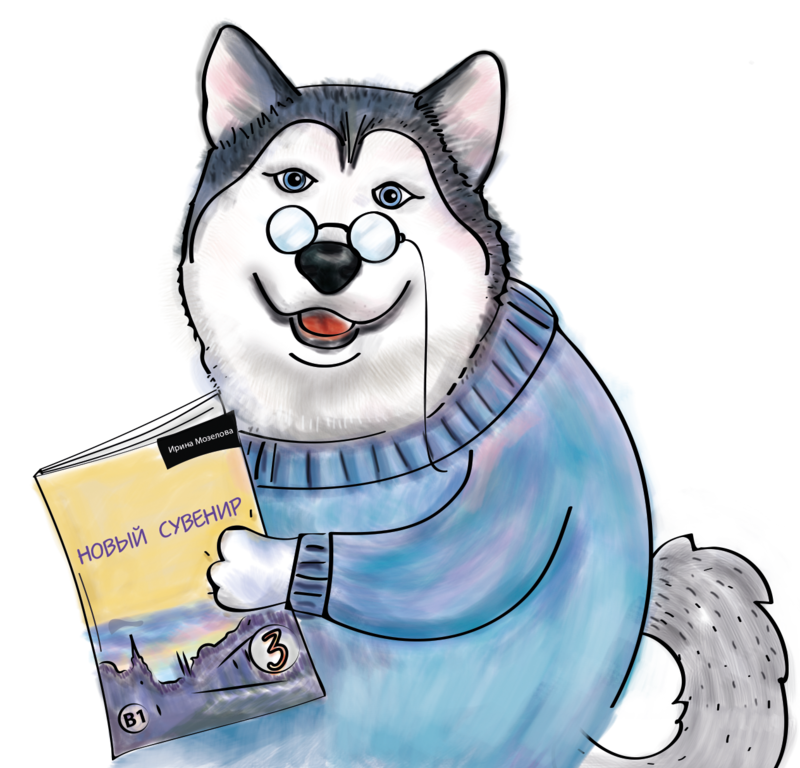 Это книга Джорджо. – This is Giorgio. This is Giorgio’s book.